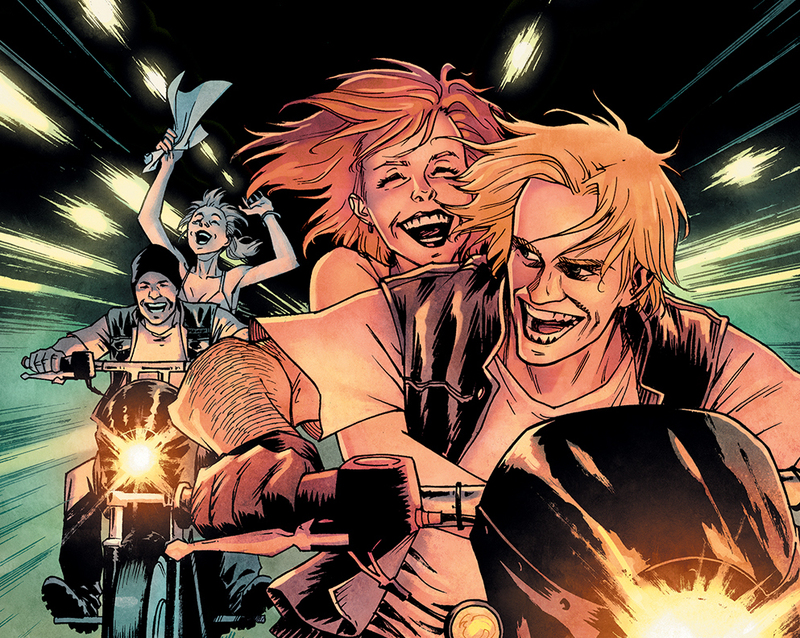 Sons of Anarchy: Redwood Original #2 Review – AiPT! The Sons threaten turf wars and play sheriff in the second issue of Sons of Anarchy: Redwood Original. We open on a trailer in the desert at night and s--t’s about to get real. What to do? Club members circle the massive SOA meeting table as they debate how to offload the merchandise from their last transaction. It becomes very clear that the club has a disdain for drugs. Wayne Unser makes an appearance in this issue as well, reinforcing the unusual bond between the law and the lawless for the good of Charming. Jax continues to struggle with fulfilling his father’s legacy. Both he and Opie are trying to live up to their father’s expectations despite being on very different paths–one a thug in training and the other a college student, each trying to find themselves while pleasing others. Jax wants so desperately to belong and to serve the club but his youth shines through and gets the better of him. He is still a naive prospect no matter how tough he appears on the outside. In Sons of Anarchy: Redwood Original #2 we see the first glimpse of Jax’s moral compass that becomes a larger part of his actions later in life. Masters does a fantastic job of balancing the storyline. Moving back and forth between the juvenile bravado of Jax and Opie and the harsh business of the older members of the club. Underneath their tough exteriors these men seem to want to do right by their town and their families, they just happen to go about it in a criminal manner. It’s not all serious though; Tig is still up to no good which always leads to some comic relief. Before I continue this review I wish to extend my apologies to Adam Metcalfe for associating him with some dark shading in the last issue. No hard feelings. I am really digging the art all around. The trailer scenes, beginning and end, are a vibrantly grisly, eye-popping experience. Shades of purple and blue with bursts of yellow incandescent light and crimson blood splatters fill the page. The panel layouts are inventive in this issue as well. Scaling the panels and layering make for a visually appealing page while the angled panels aid in the action scenes by creating an extra layer of movement. Did I like It? Yes. Ride on Sons. The road is long and the hour is early. I look forward to the journey. My Fears? That I don’t get caught with drugs in Charming.